JEFF WHO LIVES AT HOME: Movie Reveiw- Destiny Calling in a Basement! It is “the greatest day in the history of the world” – a quote pulled from brothers and main characters Jeff (Jason Segel) and Pat’s (Ed Helms) deceased father in a dream. And it just so happens to be the one day in the life of Jeff in Paramount Pictures “Jeff Who Lives at Home” who reconnects with his family on a human level on the same day. Jeff is a character whom his family consisting of his mother Sharon, (Susan Sarandon) and brother Pat passes off as an underachiever to the extreme. Jeff lives in his mother’s basement where the majority of his days are spent eating, smoking weed, and watching infomercials like the “incredible vitamin” and consistently searching for a sign to something greater to his seemingly detached existence. Jeff becomes obsessed for his signs of something greater after watching the alien invasion film “Signs” starring Mel Gibson, Rory Culkin, and Abigail Breslin. 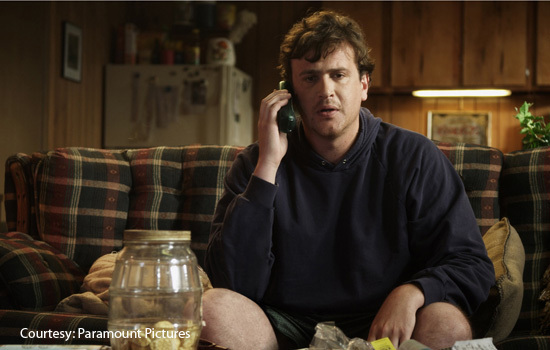 Jeff (Jason Segel) receives a sign in a phone call in the basement. When Jeff gets an arbitrary sign through a phone call, it puts his world into an unexplainable focus to reaching his destiny while fighting-off the negative reactions from his brother and mother. The end result is a new view of Jeff as someone who is fearless, and open to seeing the world as it really is and not just as a spectator passing through it. The signs may hold coincidence in Jeff’s life, but for many they are always there. Just few are able to see them. “Jeff Who Lives at Home” is a meaningful story about what happens when you open yourself up to the unexpected and what you might gain by putting yourself in a vulnerable position. All too much is needlessly lost due to fear of consequences and what others might think. This life is your own and it IS what you make of it is the underlying message of the film. “Jeff Who Lives at Home” is written and directed by brothers Jay and Mark Duplass. Their past films include shorts and a documentary (called “Kevin”). During a press conference, the duo talked about their unique way of making this film. They said that they fully lit each scene before the actors stepped onto the set. After that, the actors were free to improvise and play-out the scenes with each other. Mark stated that there were “no rehearsals on the film. We don’t believe in the rehearsal process in this instance because you might lose something that you don’t get (on film).” Mark also said that once the camera is rolling, they don’t like to stop because “you lose the moment”. The movie was filmed in New Orleans, but the story takes place in Baton Rouge. Jeff’s bravery rubs off on Sharon and Pat. Directors said that Jeff is a character that really sacrificed a lot by not getting a regular 9 to 5 job and getting married. “He is holding out for that grander that he knows he is meant for” said Duplass. This is something that is admirable and most people secretly wish that they could do according to film makers. 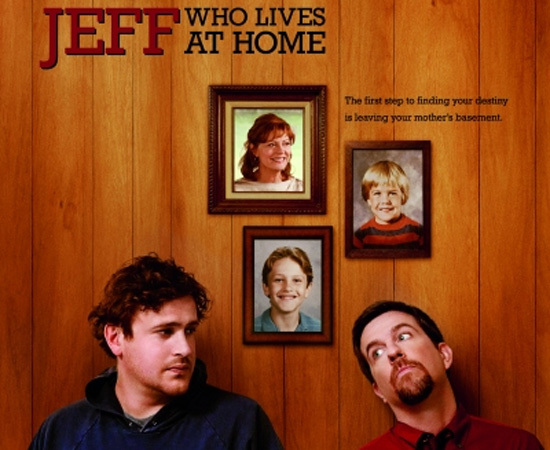 “Jeff Who Lives at Home” opens in limited theaters on Friday, March 16, 2012.